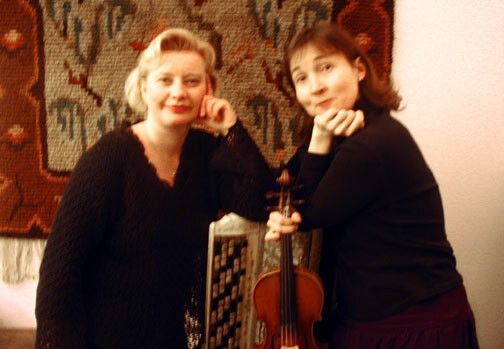 When two teenage girls started to play Finnish folk music back in 1976, no one could expect the collaboration to turn out to be longlasting and especially fruitful. It was the result of an initiative of the Espoo music institute to let their students, basically trained in classical music, get in touch with the traditional national music. Teachers were chosen from the Leikarit group, which specializes in music from the Espoo area. In the years to come the girls started to play more and more together, became friends and took part in competitions where they usually collected top prizes. Meiskarit was born. Life went on, Maria entered the Sibelius Academy as one of the first shift to major in folk music. She was recently appointed honorary professor and is pursuing an active carreer as a performer all around the globe in various groups while teaching at the Sibelius Academy. Maarit took her degree as a classical violinist from the Moscow Tchaikovsky Conservatory and is playing in the top level Tapiola Sinfonietta chamber orchestra these days. 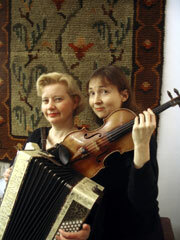 During the years Meiskarit has appeared in countless radio recordings and done many trips abroad. 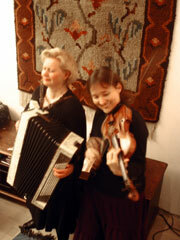 A special place in their repertoire is reserved to the music of Maarit's father, accordionist Martti Kyllönen. It was him too, who would drive them to their concerts, while the girls were chatting and having fun ('meiskata' in finnish) in the back seat. Another accent in the repertoire lies on traditional Swedish polskas and waltzes which may find it's origin in the fact that Maarit was born in Sweden and Maria is a Swedish-speaking Finn. Maria Kalaniemi, a master of free-bass button accordion, is one of Finland's leading contemporary accordionists. Once a member of pioneering groups Niekku and Aldargaz, from the famed Sibelius Acdemy Folk Music Department, where she now teaches, her roots are in folk and classical music but her sights and abilities go far beyond existing styles. Technically brilliant as a player, and adept at improvisation, she is also a very powerful, intuitive and sensitive composer, with pieces that stylistically touch in numerous areas but feature her own personality as the driving force. Melody is the meaning and with Maria, listeners are sure to feel her message deeply. Maria has released many albums, the latest are the duo and live trio CDs with pianist Timo Alakotila. 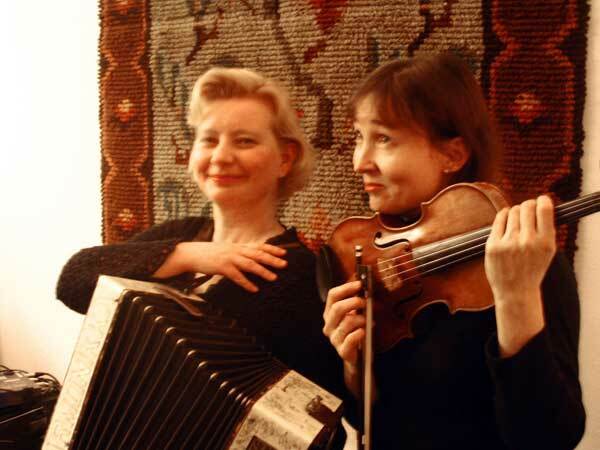 She is also a member of the international accordion collective Accordion Tribe, Swedish-Finnish music group Ramunder, UNTO Tango Orchestra as well as many other projects. 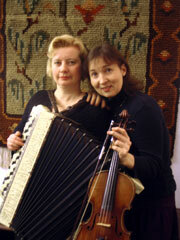 Maria has toured and performed with these groups and other projects throughout Europe, USA and in Canada. Her new work is centered around solo accordion pieces. In Sept. 2005, the Arts Council of Finland appointed Maria Kalaniemi one of four new Artist Professors for a five year term alongside composer Kaija Saariaho, writer Olli Jalonen and artist Juho Karjalainen. This is the second time the Professorship has been awarded to a composer/musician from the folk music field, the first being Heikki Laitinen in the mid 90s. Maarit Kyllönen was born in Sweden where she spent her first nine years. She started playing the violin after moving to Finland. 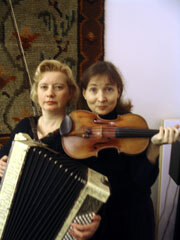 After winning a national competition, Maarit entered the Moscow Tchaikovsky Conservatory and graduated in 1986. After doing postgraduate studies in Holland, specializing in chamber music, she auditioned and won a spot in the prestigious Tapiola Sinfonietta chamber orchestra where she's been playing ever since. Maarit is an eager and active chamber musician and a very enthusiastic teacher at the Espoo Music Institute where she also leads a folk music ensemble. Annual visits to the Kaustinen festival, as a member of the group Leikarit, have been a longtime habit. Her greatest hobby are her three children that inevitably are brought up in a musical world balancing between classical and folk music.